A fusion of Shabby Chic, French Country, Hollywood Glam and Paris Apartment Style, the Châtelet design aesthetic is eclectic, whimsical and unabashedly feminine. 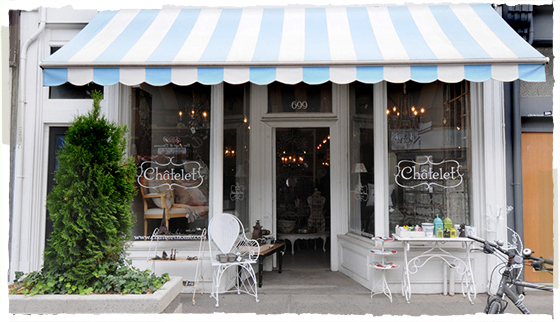 Specializing in white-painted furniture, mirrored furniture, beaded chandeliers and one-of-a-kind vintage finds, Châtelet invites you to put your own spin on a look that is inherently individualistic, yet fundamentally collective. A feeling of connection to your home environment, nostalgia for things that have stood the test of time and – above all – joie de vivre is central to the Châtelet aesthetic and ethos. White-painted furniture, Mirrored Furniture, Beaded Chandeliers and one-of-a-kind vintage finds. We have an Extensive Collection of used Furniture at our Furniture Warehouse in Toronto, that is open to the public by appointment only. Please contact us if you are looking from something original for your home. In addition to Châtelet’s assortment of vintage and vintage-inspired furniture, lighting and wall décor, not to mention our custom-made offerings of headboards, furniture, lampshades and draperies, Châtelet also carries amazing gifts, home accessories, decorative drawer pulls, quilts, bedding and other miscellaneous beautiful things that you never knew you totally needed.